The big day is here! It’s trade show week, and your brand is excited to get the party started. Even if your booth location isn’t where you thought it would be, you can make the most of your trade show to attract new customers. We’ve compiled the three best ways to get consumers excited about your brand at trade shows. From promotional gifts to placement strategies and theme ideas, we’re here to help you have the most exciting booth! At a trade show, fun promotional gifts seem like a no-brainer! Are you a technology company? Try giving out flash drives with your logo or power banks to charge a potential customer’s devices. Have a brand that focuses on fun in the sun? Try giving out promotional umbrellas with a sunny logo or even branded baseball caps for a game at the park. Try to find products that best match your company’s identity, and use brand colors so your consumers will remember. According to a study in the Malaysian Journal of Medical Sciences conducted by Mariam Adawiah Dzulkifli and Muhammad Faiz Mustafar, human memory has a strong association with color. By branding your materials with your company colors, you will help your consumers know your brand and get them talking about it. According to Post-Up Stand, many booths include a standard layout of brochures in the front and products in the back. While this method has worked in the past, it seems commonplace. Post-Up Stand recommended placing your products or services in the front and sectioning your booth. The sections could possibly be the history of the company, the company today and its future prospects. Trade shows allow you to be expressive and market your business in a unique environment. Having fun with layout gives consumers a reason to remember and appreciate your company. Changing your booth layout is a creative way to display your brand at trade shows. 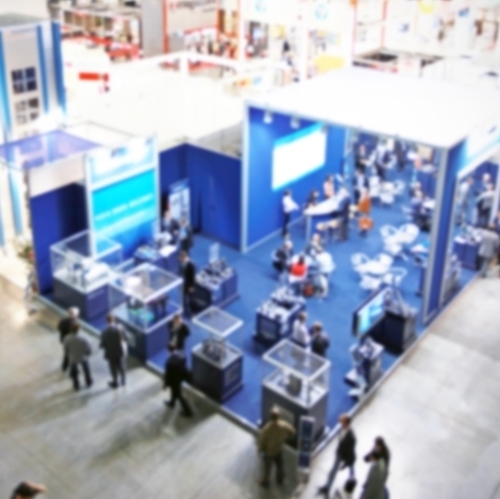 It may seem like common knowledge, but quickly connecting with your new leads at trade shows gives your brand a professional edge. These quick responses say “My brand is ready to work for you” and “We’re enthusiastic and excited about what we do.” Try responding to all leads within a period of 24 hours. If possible, respond as soon as the trade show is over for the evening.